I love weddings photos taken at Barcelo Maya Palace Deluxe. This splendid resort located minutes from Cancun, is a great wedding venue. This resort boasts amazing facilities, extremely friendly and industrious staff, a gorgeous beach and delicious food. Now that we clarified that the place is definitely a smart choice and is a serious destination wedding attraction, let's talk about this particular shot. 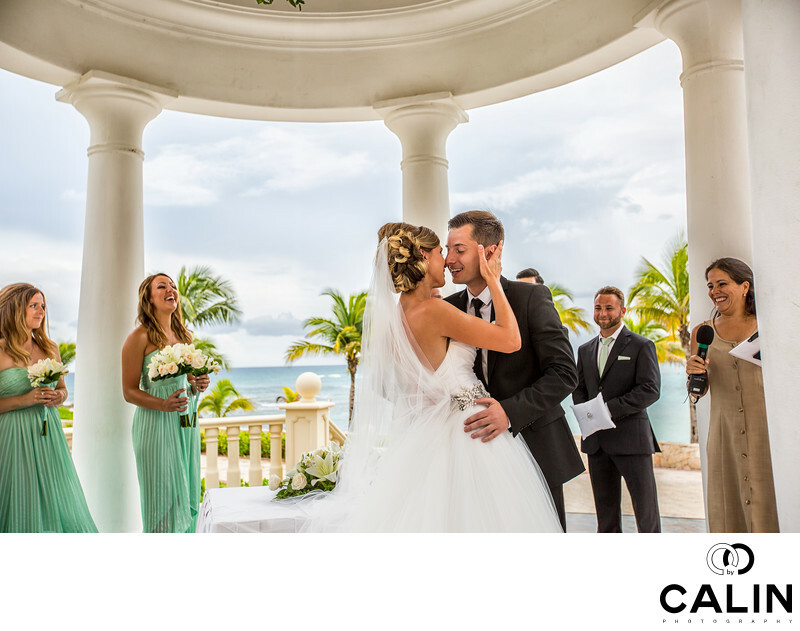 In my opinion, what makes this photo, is not the beautiful gazebo at the Barcelo Maya Palace Deluxe (wow, that is a long name), the ocean or the bridal party faces. What makes this wedding photo beautiful is the genuine emotion of the bride and groom just before the first kiss. There could not be a more sincere smile and emotion than this. I find this photo even more powerful than the first kiss. The mystery of not actually knowing if they kissed or not makes this picture powerful. The multiple layers add to the strength of the image: the bride and groom in the foreground, the bridal party in the middle and the beautiful Riviera Maya beach in the background. I remember that day the light was tough with the sun coming from behind the bride and groom causing my lenses to hunt. Despite the fact I use only professional Canon cameras and lenses intense back lighting causes the lenses to hunt. Because the guests were making so much noise I could not hear the lens focus so I was not sure if I got a properly focused photos of the first kiss. Fortunately, I was able to capture such beautiful moment. Location: Carretera Chetumal - Puerto Juárez Km. 266.3, 77750 Solidaridad Riviera Maya, Q.R., Mexico.